Check that �turn power off� is displayed on the multi-information display and then press the engine switch once. Check that �turn power off� on the multi-information display is off. Message illustrations used in this section are intended as examples, and may differ from the image that is actually displayed on the multi-information display. If the vehicle is left in accessory mode for more than 20 minutes or ignition on mode (the engine is not running) for more than an hour with the shift lever in p, the engine switch will automatically turn off. However, this function cannot entirely prevent battery discharge. Do not leave the vehicle with the engine switch in accessory or ignition on mode for long periods of time when the engine is not running. Check that the shift lever is securely set in p. The engine may not start if the shift lever is displaced out of p.
After turning the engine switch off and opening and closing the doors, the steering wheel will be locked due to the steering lock function. Operating the engine switch again automatically cancels the steering lock. �Steering lock active� will be displayed on the multi-information display. Check that the shift lever is set in p. Press the engine switch while turning the steering wheel left and right. To prevent the steering lock motor from overheating, operation of the motor may be suspended if the engine is turned on and off repeatedly in a short period of time. In this case, refrain from operating the engine switch. After about 10 seconds, the steering lock motor will resume functioning. When operating the engine switch, one short, firm press is enough. If the switch is pressed improperly, the engine may not start or the engine switch mode may not change. It is not necessary to press and hold the switch. If attempting to restart the engine immediately after turning the engine switch off, the engine may not start in some cases. After turning the engine switch off, please wait a few seconds before restarting the engine. Always start the engine while sitting in the driver's seat. Do not depress the accelerator pedal while starting the engine under any circumstances. If engine failure occurs while the vehicle is moving, do not lock or open the doors until the vehicle reaches a safe and complete stop. Activation of the steering lock in this circumstance may lead to an accident, resulting in death or serious injury. If you want to stop the engine in an emergency while driving the vehicle, press and hold the engine switch for more than 2 seconds, or press it briefly 3 times or more in succession. However, do not touch the engine switch while driving except in an emergency. Turning the engine off while driving will not cause loss of steering or braking control, but the power assist to these systems will be lost. This will make it more difficult to steer and brake, so you should pull over and stop the vehicle as soon as it is safe to do so. 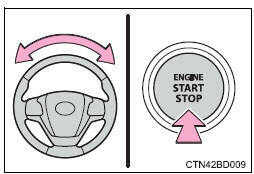 Do not leave the engine switch in accessory or ignition on mode for long periods of time without the engine running. If "accessory" or "ignition on" is displayed on the multi-information display while the engine is not running, the engine switch is not off. Exit the vehicle after turning the engine switch off. Do not stop the engine when the shift lever is in a position other than p. If the engine is stopped in another shift lever position, the engine switch will not be turned off but instead be turned to accessory mode. If the vehicle is left in accessory mode, battery discharge may occur. If the engine becomes difficult to start or stalls frequently, have your vehicle checked by your toyota dealer immediately.